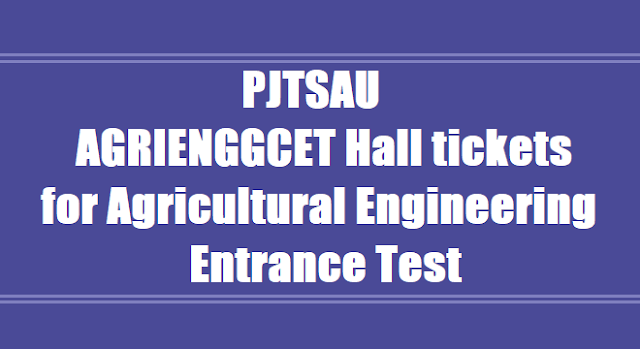 PJTSAU AGRIENGGCET 2018 Admissions Counselling, Results, Hall tickets (Agricultural Engineering Entrance Test): PJTSAU AGRIENGGCET 2018 Results, Hall tickets, TS Agricultural Engineering Entrance Test 2018 Results, Hall tickets, PJTSAU AGRIENGGCET 2018 Results, Hall ticket numbers of Eligible Candidates, Agricultural Engineering CET Results 2018. Agricultural Engineering Entrance Exam date. Professor Jayashankar Telangana State Agricultural University Agricultural Engineering Common Entrance Test 2018 Notification for B.Tech Agricultural Engineering) Degree Programme. Professor Jayashankar Telangana State Agricultural University, Administrative Office, Rajendranagar, Hyderabad-500 030 issued theAGRIENGGCET-2018 Notification in June 2018 and this Entrance Test for three year Diploma in Agricultural Engineering Candidates for Admission into 2nd year of 4 year B.Tech (Agricultural Engineering) Degree Programme for the academic year 2018-2018. The Counselling for admission into B.Tech. (Agricultural Engineering) through AGRIENGGCET-2018 on 08-08-2018. The Counselling for admission into B.Tech. (Agricultural Engineering) based on ranks obtained in AGRIENGGCET-2018 will be held on -......-2018 in 11:00 AM. The candidates are called in the ratio of 1:2 for the counselling.